The yellow fever mosquito Aedes aegypti. Note the marking on the thorax in the form of a lyre. Photo by the Centers for Disease Control and Prevention. An unusual amount of rainfall in Wisconsin has resulted in lots of standing water in places that are normally dry. Unfortunately for people, mosquito larvae, sometimes called wrigglers, develop in standing water, so their populations have surged in the last few weeks. Unclog rain gutters so water doesn’t pool. Drain and fill stagnant, puddles, ditches or any wet areas around your home and property. Clear weeds and vegetation away from the edges of ponds, near houses, and in nearby lots – adult mosquitoes hide in them. Inside the house, keep window and porch screens in good repair. Use weather-stripping to fill gaps around windows and doors. 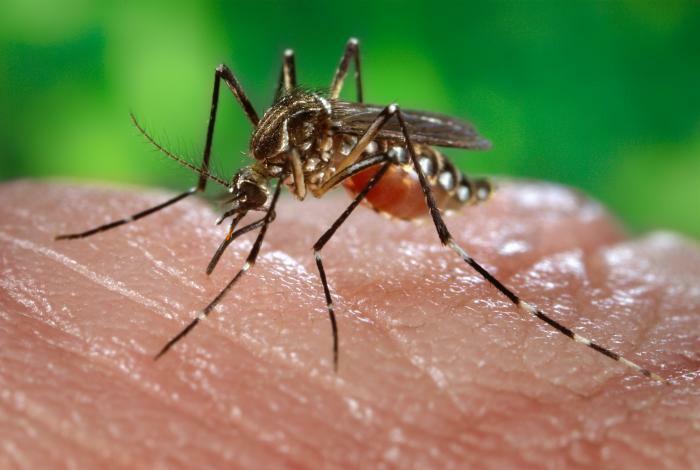 Remember that mosquitoes also bite animals; provide pets refuge inside the house or in screened-in areas. Wear light tones – dark colors attract mosquitoes. For more information, see “Mosquitoes in and Around the Home” at extension.entm.purdue.edu/publications/E-26/E-26.pdf.